We offer the full Orkney diving experience, taking in the best of the famous Scapa Flow wrecks, seal diving, scenic diving, scallops, lobsters and even the odd crayfish, the North Isles wrecks and different harbours each evening, so no Stromness every night or the restrictions of just having a small day boat for your use. If you want all wrecks, no problem, a mix of wrecks and scenic and wildlife, no problem. Even if you want to dive Scapa Flow all week it’s no problem, we are not limited to 2 dives a day and seals are a fantastic lunchtime snorkel even if they do frighten you! 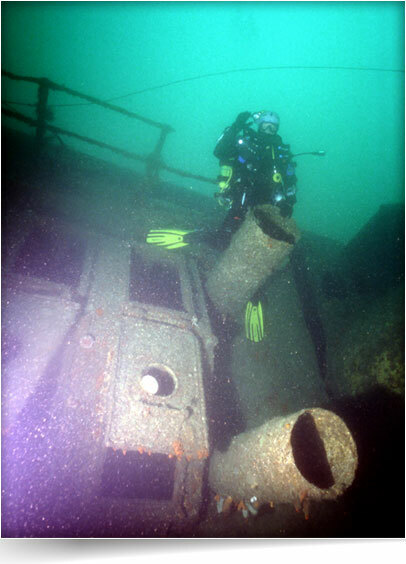 On arrival on Saturday (unless on the late ferry) we will depart for a dive on the German fleet in Scapa. If you are too tired after the journey then just relax and grab some sleep in your cabin. We will overnight in Longhope on Hoy at the south end of the island. There is a small, very local island pub, be wary of the landlord’s hospitality! Sunday morning we head to the Coln, probably the best of the cruisers these days. We go to Lyness at lunchtime and after food visit the naval museum. The afternoon dive has options – another cruiser or the UB116 makes a good second dive in what is normally better visibility as you move out of Scapa Flow. We overnight in Burray, where good food and nice bar make the evening slip by. Monday we plan the James Barrie, an excellent dive that is very recognisable in good visibility. It is testing as it lies in 42m and is a slack water dive, an excellent introduction to the diving we get in the North Isles diving way. We now leave Scapa Flow behind us and head north, diving is on either the Pennsylvania or Aorangie, both shallow dives rarely looked at by recreational divers. We overnight in Orkney’s capital, Kirkwall. There’s lots to see here, with the cathedral with the bell off HMS Royal Oak on display, restaurants galore and pubs to relax in. The morning takes us to the wreck of the Cotavia, huge steam engines and was that really a huge brass propeller blade that you saw, or was it two of them? And wreckage galore; a challenging slack water dive in 42m. We then head further north to dive a tug in shallow water at Eday. After you have seen the wreck, drift off and pick up scallops. On our way to Sanday for our overnight stay we can stop off at the seal colonies for a swim with our grey friends, take your cameras and videos for this one! We overnight in Sanday, a huge island. The owner of the Kettletoft Hotel is Mark and he kindly picks us up with his bus for an evening in his place. The food is good and atmosphere definitely of an island, I enjoy it here. Leaving Sanday behind us we head south to dive the HMS Zarefah, this was a large well-built steam ship that was run by Oxbridge members and was conscripted for the first war and was sunk off the Mull Head by mines. Fittings on this wreck are of the finest materials, depth is about 40m and it is a slack water dive. Be ready on time or you will miss it! We then take a lunch break on Shapinsay, the home of Balfour Castle, and in the afternoon dive one of the steam drifters close to the island. These lie in about 22m and there’s a good chance of a lobster here. We then sail north to Westray, home of Orkney fish and chips in the Pierowall Hotel. Westray is behind us and we travel to the North and West to dive the Tomalina, a unique wreck literally in a gully under the Westray lighthouse, a site that has to be seen to be believed. The site is very weather dependent but is a brilliant swim. Be careful to listen to the brief on this one as entry and exit from the water depend on your acting correctly in the water. Testing but well worth it. Near here is an area that we used to dive for crawfish at, if conditions are good then why not try your luck. Far sweeter than lobster, a crawfish is a real treat if your luck is in and it’s a nice scenic drift along the area anyway. Heading south now we head towards Stromness. Diving the Tabarka in Hoy Sound is a favourite before we overnight in Orkney’s second town, where the pubs are lively and the food is good. Our last day brings us to a German battleship. For those who want to go deeper the SMS Markgraf is the choice (45m) or for those who want to stay a little shallower (38) the SMS Kronprinz Wilhelm is your option. These wrecks are huge and have a fantastic history so do a bit of research to be aware of what they are about. They are like colossal metal reefs with guns on them so should keep everyone happy. The last dive of the week we do on a vote, another blockship? Maybe the Gobernador Bories, SMS Carlsruhe, etc. The above is a suggestion of an itinerary that would give you a good look around the islands and experience a broad range of underwater situations. 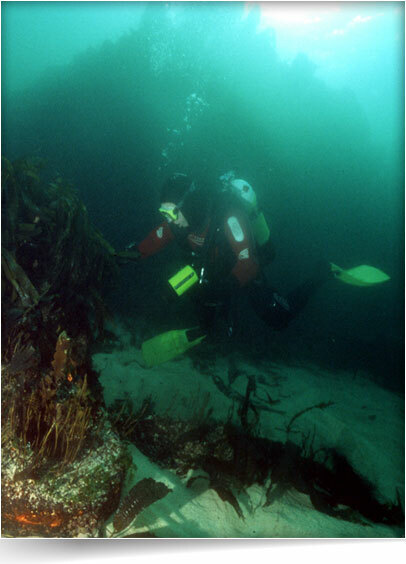 Trips out to Suleskerry and Sulestack to see the wrecks out there, the island of Stroma in the Pentland Firth is the first in a series of dive sites very rarely looked at, it has wrecks and a large seal colony, the list goes on and on and the options are there for you to take. Just let us know!